ShootOut No-Tip Soccer Goals from Future Pro eliminate the need for loose ballast and ground anchors. Goals are easy to transport on rolling drums that double as built-in ballast to reduce tip-over injury and eliminate the hassles of ballast or anchors. Additional safety features include extra backstay depth, radii on all square post corners, no-hardware net attachment and optional goalpost padding. No-Tip goals meet or exceed NCAA, NFHS, FIFA and AS™ F2056 standards. With Douglas® Pro™ Adjustable Basketball System, you can choose from four standard units to meet your needs. Features include completely welded components for uncompromised strength and durability, and a superior mounting system for ease of installation and relocation. The Pro™ series comes complete with a tempered glass backboard, Pressure Flex™ Goal, backboard padding and wraparound pole padding. Beacon's TUFFframe Tensioned Batting Cage System is fast and safe. It can be removed daily or seasonally in just minutes. Once the poles are set, it takes two people less than 10 minutes to install or remove the cage net—without ladders. Beacon's premium batting cage net is suspended between the poles while the Tenex top cables are tensioned by winch and cable units to minimize sag and maximize hitting and pitching space. 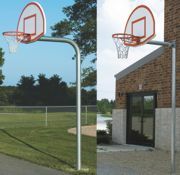 Draper Inc. offers 10 different outdoor basketball backstops, including both stationary and height-adjustable units, and back-to-back backstop systems. In addition, Draper offers official-size high school and collegiate football goalposts, outdoor volleyball nets and posts, and soccer goalposts and nets for youth, club and official levels of play. Rounding out Draper's line of outdoor products are various models of park and player benches, bike racks, tetherball and tennis fixtures. First Service specializes in providing outdoor athletic equipment to high schools, colleges, military, park and recreation districts, private clubs and corporate fitness centers nationwide. Look to First Service for basketball, volleyball, baseball and soccer equipment, bleachers, protecting padding, scoreboards and more. First Service promises to deliver superior products at competitive pricing with excellent customer service and attention to detail. Pocket Radar™ is the radar gun designed for industrial and sporting applications. A perfect training tool for baseball, softball, volleyball, tennis, hockey, lacrosse, golf, winter sports, RC hobbyists, archery, trap-shooting and many more. Discretely measure car speeds, bike speeds, skate speeds and even the speed of a person running. Accurate to +/- 1 mph and provides more than 10,000 readings on two AAA batteries. The Pro-Stripe Heavy-Duty Markers are the highest quality dry line markers available in three models to meet any budget. Features upgraded structural steel, deluxe heavy wall tubing, handlebar style handles, premium 10-by-4-inch pneumatic wheels with steel rims and axle blushings, fingertip controls, rubber handle grips, high-quality electrostatically powder-coated finish, dual direct drive front wheels and hinged lids to keep material dry. Designed to be the world's best competition sand volleyball net system, the Sand Pro Telescopic is a re-engineered version of Schelde's Telescopic Pro System, built with stainless steel and aircraft aluminum for long-lasting outdoor use. Telescopic posts feature Pin-Set net height settings, adjustable rubber feet and Schelde's exclusive linear winch. Designed for use with Schelde's Kevlar® Outdoor Net and TwistLock™ Sand Volleyball Ground Sleeves. Schelde offers a full range of volleyball net systems for indoor and outdoor use.